A former Butch Otter staffer leaked a partial audio transcript she secretly recorded at an informal meeting Otter held with his Chief of Staff and the Director of the Idaho Department of Health & Welfare. 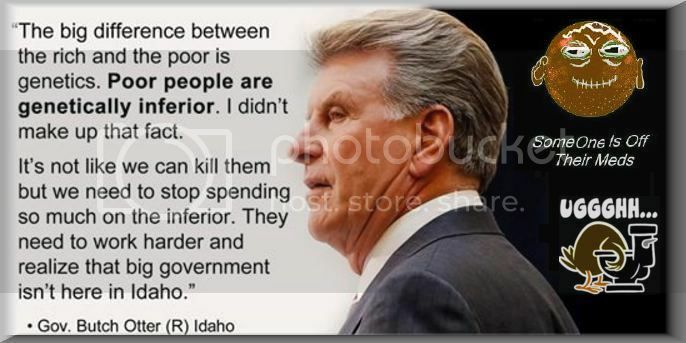 The lurid, rambling transcript reveals a Nazi-esque attitude toward Idahos poor. [unintelligible] the people wont be able to compete with the superior, but lets keep the message that they can and everything will work fine. The staffer says the three men often get together to candidly discuss issues affecting the State. The staffer claims to have other recordings regarding Otters belief that gay people have a genetic flaw, his plan to eradicate wolves in Idaho and his desire to further criminalize marijuana laws. An expression that is said when one accuses another person of that which they are guilty of. Many years ago, people used to cook over an open flame using copper kettles and iron pots. The copper kettles were usually polished after every use whereas the iron pots were not and remained blackened from the soot from previous cooking. Well someone got the idea that if the iron pot were alive and it looked at a nearby copper kettle, it would see a black image. The iron pot believes it sees the image of the copper kettle when in reality, because the copper kettle was polished, what the iron pot sees is a reflection of itself. This symbolic phrase became associated with hypocrisy. An accuser blames someone else for having a fault when the accuser, themselves has the fault (and generally in abundance). This can also sometimes be shortened to "pot, kettle, black."